ISLAMABAD: In early November last year, Muhammad Islam was surprised by news from the Pakistan Meteorological Department. The 40-year-old farmer learned that good rains were forecast for the crucial wheat growing months of November and December. That was important information, as farmers in the northeastern districts of Potohar region had turned away from wheat - a favoured and high-earning crop - as unpredictable rains over the last decade led to repeated crop failures. This year, however, they expect their income to increase as they return to wheat production, after years spent planting some of their land with less lucrative vegetables and tending poultry. Well-timed seasonal rain forecasts from Pakistan’s weather service - something new in the country - are making that possible. “I would have been, for sure, at a loss and missed the timely wheat plantation, had I ignored the rain forecast ... on a local news TV channel,” said Islam, who farms 4 acres (1.6 hectares) of land in Bhata, a village about 50 km (30 miles) from Pakistan’s capital. Winter rains that traditionally fell in mid-November came as late as the end of December in 2016, part of a trend of erratic rains that has confounded farmers who are entirely reliant on rainfall because they lack irrigation systems. But last November the meteorological department correctly forecast rain for early November, giving Islam and farmers like him the opportunity to plough their land and be ready to sow. Islam planted wheat on half his land in the third week of November, leaving the rest for vegetables. By Jan. 17, he says, the wheat plants had grown to a height of 70 cm, whereas in the past eight years they never grew to more than 10 cm over the same period. As a result, he and other farmers in the area expect to get at least 1,200 kg of wheat from each acre this year - 30 percent more than in previous years. Islam reckons this will increase his own income by around 23,000 Pakistani rupees ($210). Wheat is grown on 22 million acres (9 million hectares) of land in Pakistan - nearly the size of Jordan - 30 percent of which is rain-fed. Each year, the country produces 25 million tonnes of the crop. About 3 million tonnes of this is grown on the Potohar plateau, comprising Islamabad and the surrounding districts of Rawalpindi, Chakwal, Jhelum and Attock. The area is characterised by subsistence and smallholding farming. Farmers usually finish sowing wheat by mid-November, and under normal circumstances two rainy spells in November and December drench the fields, allowing the seeds to germinate. After two or three more spells of rain in January and February, the harvest begins in April. But the erratic rainfall of the last decade has pushed farmers to shift to other crops in the Potohar region. 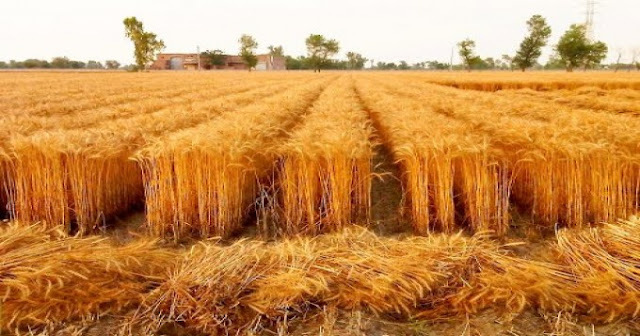 Wheat acreage there has declined by around 30 percent compared to 10 to 12 years ago, when rains were abundant and predictable and farmers could reliably harvest at least 1,000 kg of wheat per acre, according to the Barani Agriculture Research Institute, a state-run body in Chakwal district. Many farmers say they struggle to build rainwater harvesting ponds, use groundwater or adopt the latest efficient irrigation technologies.